Is anyone using Bitwig? Not much about it on this forum and indeed most forums are sparse. I've been clicking around on it and I like it. Heh heh... I guess no one is using Bitwig!! no, sorry, if there are no presets in the Bitwig Sampler format or the open SoundFont format of those packs, they will not work in the Bitwig Sampler. I use it and I think its brilliant. However, I can’t answer your question sorry! Good to get a response direct from Bitwig though. blinddrew wrote: Good to get a response direct from Bitwig though. The last sampler I used was Gigasampler. Appears defunct now. The Kontakt player is free and will normally play most Kontakt sample libraries. There are some limitations compared to the full Kontakt, but probably nothing that stops you getting the basic sounds from the samples. Wonks wrote: The Kontakt player is free and will normally play most Kontakt sample libraries. There are some limitations compared to the full Kontakt, but probably nothing that stops you getting the basic sounds from the samples. If I understand correctly, the Kontakt Player only plays encrypted samples as a form of copy protection. In this application, the full Kontakt sampler is required. I picked up the AIR Structure 2 sampler on sale. Should get the job done nicely. I must admit I thought the bitwig sampler supports soundfonts! You just drag them to the track and it creates the sampler. Just looked at the sample from mars site, looks like they are all available as wavs anyway so bitwig would be fine. BobTheDog wrote: Just looked at the sample from mars site, looks like they are all available as wavs anyway so bitwig would be fine. Heh... I guess I don't know what that means. I just want to consume what I think is a preset keyboard layout. Whatever mappings etc already set up. Plug n PLay if you will. I haven't had time to have a go yet... but to me, using the wav files implies I would have to build all that? Yep you would have to build it, it isn't particularly hard to do though. I have just downloaded the entire bundle and tried some with bitwig. 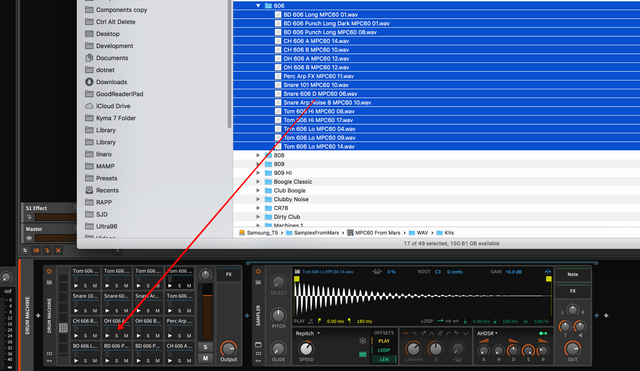 The wav files are well named, so for a synth type sound you grab all the samples and drop them onto a sampler device and it basically works it all out, you might need to fiddle around a bit but you would learn something. Part of the fun of samples is making something new. For the drums stuff, just create a Drum machine and drag a kit (folder of wavs) to it and it works it all out. Then you can start messing about and having fun. BobTheDog wrote: Yep you would have to build it, it isn't particularly hard to do though. It is a different world to those old samplers nowadays, technology has moved on. Although some do say the old hardware sounds better but I must admit I'm not one of those! BobTheDog wrote: Although some do say the old hardware sounds better but I must admit I'm not one of those! Sounds like the 80s... which is unbelivably popular at the moment. I’m in Barcelona right now and sometimes I feel like I’m in an 80s time machine... I don’t mind! But it surprises me.